Here you can get answers to some of the key questions about public finance in the WASH context, as well as learn about why purple and how to tweet about us! What exactly is public finance? Why is public finance critical? Why is WASH a good investment of public funds? Doesn’t public finance inhibit markets? How did wealthy countries finance water and sanitation? Is it just about raising more taxes? Does it make sense to consider public finance in isolation from wider governance issues? What about tax avoidance and misuse of public funds? Is good data available on public budget allocations to WASH? Will domestic public finance be relevant under the SDGs? 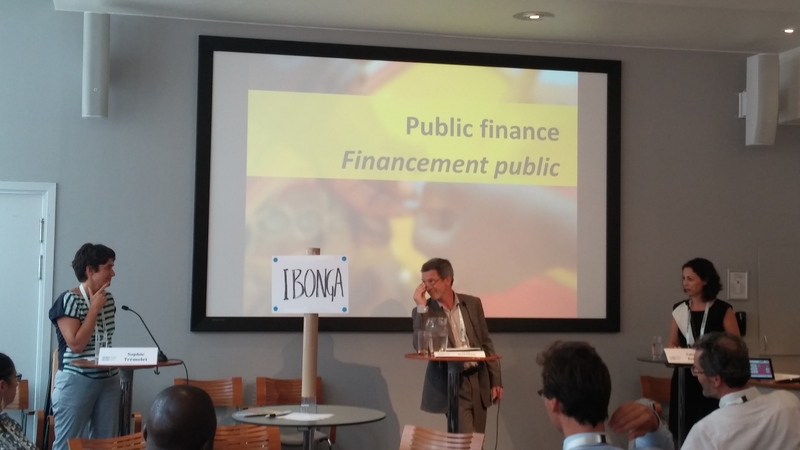 Can I influence public finance for WASH? Why is your logo purple? Can I tweet about you? We define "domestic public finance" basically as funds derived from domestic taxes, raised at the national or local level. A core principle is that funds should be raised, allocated and spent in a manner that is both cost-effective and equitable (pro-poor). Of course, domestic public finance forms part of a wider governance and financing puzzle: service delivery in poor communities will invariably involve a mix of private finance (derived from household payments for services received), domestic public finance (derived from taxes and other government revenues), and donor support (i.e. development aid). Market-based solutions and development aid, though essential, will never be able to deliver universal WASH coverage alone: they need to be supported by domestic public finance. In other words, services for the poor require substantial funds derived from progressive (i.e. redistributive) domestic taxation. In rich countries throughout the world, historically and today, water and sanitation services have been dependent on public finance. Public finance, properly used, can serve many essential functions: it can part-subsidise services for the very poor; it can support the development of profitable markets; it can provide the administrative and technical systems necessary to ensure that services are being developed sustainably. According to 2012 estimates from the World Health Organisation, the economic return on sanitation spending is on average US$ 5.5 for every US$ 1 spent. With access to WASH, people are both healthier and wealthier: people get sick less and are more productive, girls and boys become much better educated. In low-income countries, the economic cost of not achieving adequate water and sanitation may be as high as 7% of national GDP! The rich countries invested massively in universal water and sanitation coverage in the late 19th and early 20th centuries: now (to paraphrase Shakira) it’s time for Africa and Asia! No! Public finance and market-based finance are two pieces of the same puzzle! Both public finance and market-based solutions are essential for universal WASH. Spent correctly, public finance can create and stimulate markets. Just one example from the urban context: government-financed construction and management of faecal sludge transfer stations (i.e. neighbourhood-level storage tanks for sludge from latrines and septic tanks) can make it profitable for small businesses to operate commercial pit-emptying services, by reducing the distance they have to cover to transport the sludge to the final disposal point. Mostly through public finance! In almost all countries with universal water and sanitation coverage (including the US), major infrastructure was historically financed by the State. In most wealthy countries water and sanitation services remain to some extent publicly owned and publicly financed, and are extended to all members of society on the principle that it’s a social responsibility of the State to provide public services and goods essential for collective well-being. See our Library for more information. No: the entire public finance pathway is relevant. It’s important to raise more tax revenues for WASH, and it’s important to allocate more budget to WASH; but it’s also important to improve the mechanisms for transfer of revenues along the implementation chain (notably from national to local governments); and to ensure that public funds are spent in an efficient and equitable manner. Budget transparency is critical at all of the stages along this chain. Yes and no! This initiative focuses specifically on public finance, because we can create more value by focusing on a specific thematic area. But of course public finance is closely tied to wider governance issues. For example, is it of value to allocate more government finance to sanitation, if institutional mandates for sanitation have not been clearly defined? In fact there is no simple answer to this question: there may be ways of effectively delivering government money even in the absence of clear mandates. But certainly the governance context is very relevant. Why should ordinary people pay more taxes for WASH, when wealthy individuals and corporations don’t pay fair taxes, and when public funds may be misused (through corruption or simply inefficiency)? In fact, these related problems need to be combatted in parallel: tax collection from the middle and wealthy classes needs to increase, to provide a tax base for basic services; tax avoidance by very wealthy individuals and corporations needs to be reduced; and misuse of public funds needs to be combatted. None of these things is easy: but none can wait until the others are resolved! Some data is available, though often it’s much less detailed than we would like. Data on national budget allocations to WASH is being compiled by the UN-Water Global Analysis and Assessment of Sanitation and Drinking-Water (GLAAS): the GLAAS report, published every 2 years, presents data from 94 countries. The GLAAS TrackFin initiative has been set up specifically to track financing to WASH. WASHwatch.org is a useful source of information on how well countries are meeting their water and sanitation commitments under international declarations including eThekwini, SACOSAN, and the Human Right to Water and Sanitation. See our Library for more information. Yes you can! There are many ways in which different actors (including in-country civil society, in-country sector professionals, NGOs, and development donors) can influence public finance for WASH. Exactly how is too big a question for this short Q&A: possible approaches are very diverse, and include for example a) lobbying key decision-makers directly; b) providing technical support to government institutions, around how to increase tax revenues for allocation to WASH; and c) monitoring how much is currently being spent and on what. Check out our Library for more information. The colour purple is traditionally associated with wealth and prosperity, which are fundamental to the Public Finance for WASH initiative: we believe that governments need to make use of their nation’s wealth, to drive the prosperity of their citizens and hence grow their national economies, creating more wealth. Also, purple’s a neat colour: we hope you like it!